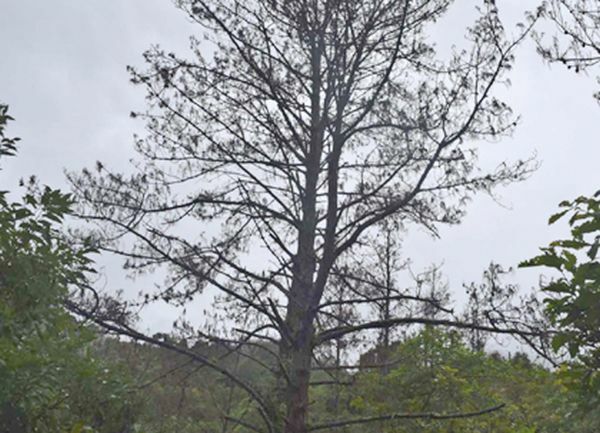 Ukhrul, August 03 2015: Outbreak of mysterious Pine tree disease in Ukhrul district has resulted in pine trees dying enmasse causing huge loss of forest product. Pine trees are grown abundantly at community reserve forests. Due to the outbreak of pine tree disease or epidemic, widely known as Tungmao in local parlance, many pine trees are dying. Young pine trees of 5-7 years old are said to be prone to the disease, Tungmao. Many pine tree growers of the district shared their knowledge about the disease during an interaction with this correspondent. They said that no other trees other than the particular species are affected or infected by the disease. Ramnganing Varah, village elder from Halang said that the disease was first noticed at Khongkhai Luinam area of Halang village 10 years back in 2005.The disease gradually spread across the reserve forests. After the pine epidemic, no pine trees were seen in the area for some time. However, pine saplings started to grow again after some period. VA member of Lunghar, Ngarummi said that the pine tree disease spread in a peculiar mode. Infection starts from upper branches and the whole trunk rotted in a few months leading to gradual dying of the tree. The disease also usually starts from the upper slope of the pine groves and spread to the bottom. The villagers also said that pine groves in plain areas are seldom infected/affected by the disease. They also added that mushrooms thrive well under pine trees. The villagers also presume that the disease started due to extensive hunting of small birds like wood pecker (Thingra in Tangkhul dialect) which feed on the pupa found in the pine trunk. The rapid decrease of the birds population has resulted in the tremendous increase of pupa. As such, the eco-cycles become adversely affected and thus the outbreak of the disease. This particular bird Thingra is now on the verge of extinction from the district, they added. According to their observation, thousands of pine trees at the age of 5-7 years have died in the last two/three years. As a preventive measure, they have chopped down and used them for fire wood. Pine tree is worth approximately Rs 330 per cubic feet. As such, the loss amounts in terms of lakhs of rupees. Pine wood is in high demand for building material, furniture and for construction purpose, etc. The pine disease infection has already expanded to neighbouring villages like Talui, Choithar, Langdang and Ukhrul. S Zimik, Talui Youth Chairman added, Talui village experienced the pine tree dying last year at Talui Hungkung reserve forest. The youth on their own initiative as a preventive measure coated the trunk with lime to prevent infection. However the disease continues to spread. When enquired, Soreiphy Vashum, Conservator, Eastern Forest, Manipur said, the same pine disease was reported at Shimla. It was infected by a fungus, feeding on other trees. One factor was continuous chopping down of a particular plant variety by the native of Shimla, where the fungus feed. She also said that the case might be the same here. Timely intervention from the department concerned and collection of sample for study to ascertain the cause of the plant disease are urgently needed. She said that preliminary preventive measures would be initiated from her side. She however will first instruct her staff to collect more detailed reports on the outbreak of pine disease in the district.